Happy week of love! My kids are gearing up for their Valentine’s Day class parties are so excited to give their valentines. This year, Hallie came home with her box assignment (Last years here) and said she wanted to create a flower pot. She’s a girl who knows what she wants…so we searched the internet for “flower pot” ideas. 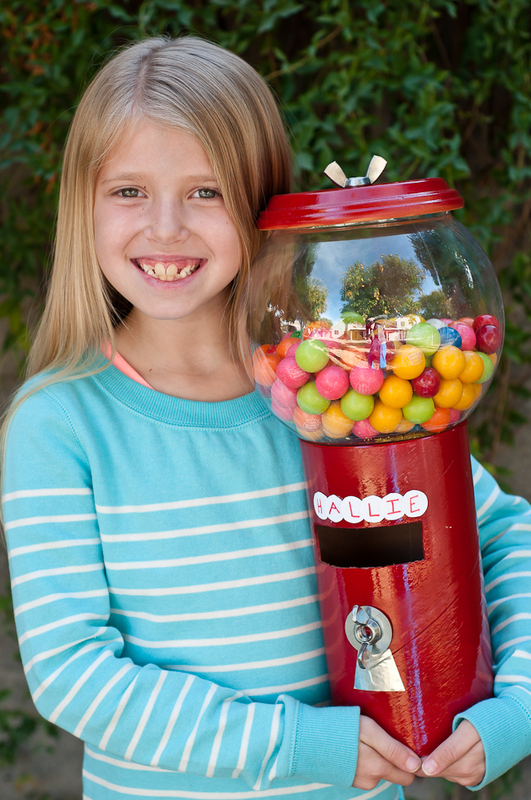 In our search, we came across this gumball machine because it used a flower pot bottom for the top. She loved it, but still wanted a flower pot. 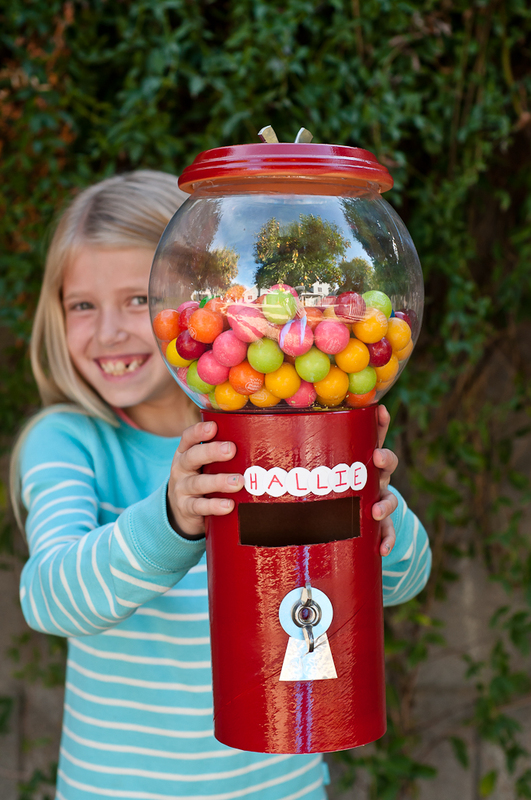 We kept searching and in the end she changed her mind and wanted the gumball machine – but only if she could also give gumballs to her class mates. Fair enough. My “sky-is-the-limit” mentality is definitely rubbing off on my daughter. I’m obviously not the person to correct her. So we worked together and made it happen. It really was quite easy and took very little time. 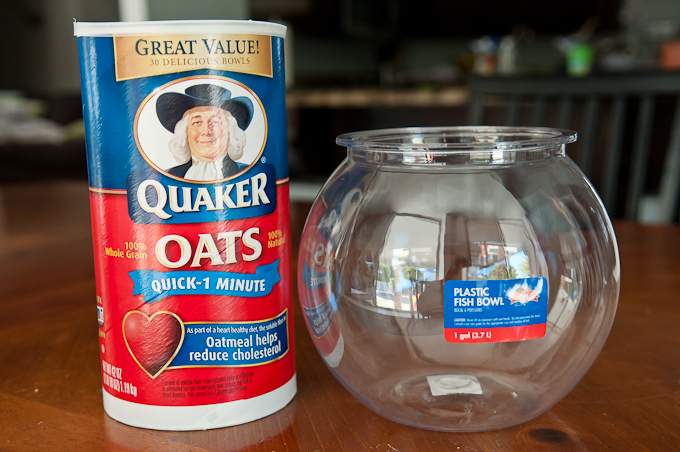 We started with an oatmeal canister and a plastic 1 gallon fish bowl from petsmart (I was able to use Steve’s employee discount for the first time in over three years). We cut a hole in the canister and spray painted it, as well as a 6″ terra cotta pot base, a nice cherry red. We hot glued a bolt on top and on the side and cut some tin foil to act as the opening of the gumball machine. I knew we had a tube of 1 inch gumballs (from World Market) stashed away in the office from Christmas two years ago that we could fill the fish bowl with. And wouldn’t you know, I brought the tube out of hiding and the majority of the gumballs were gone…we have some sneaky kids and I was reminded I need to have better hiding places! 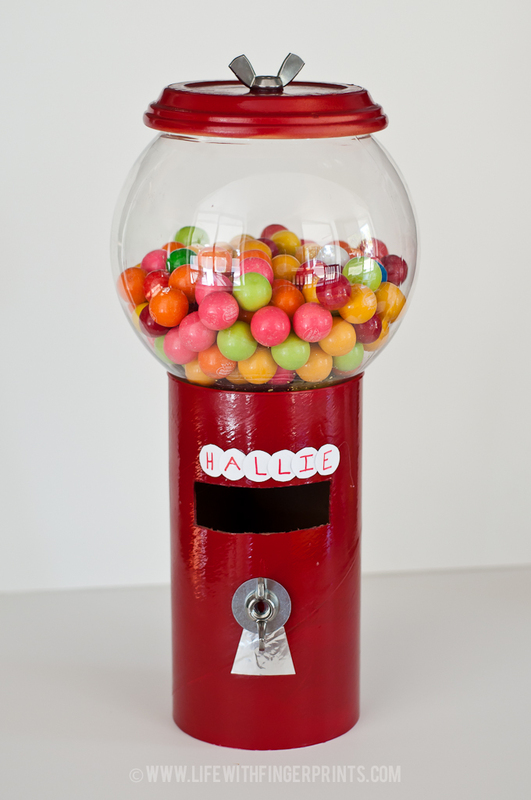 Luckily my niece came to the rescue with some old gumballs from a machine in her room. She warned us not to eat them because they were really stale – which made them perfect for our application! We didn’t attach the bowl to the canister or even the flower pot base to the fish bowl. They all just sit on top of each other. That’s the only way she was going to be able to transport it to and from school without my help. She was one excited girl walking out the door this morning with this in her hands – love her excitement for projects and love that in her mind anything is possible. I took one look at it and thought it was way too much work. But she convinced me it was doable. And it was. It was actually easy. Love my “sky-is-the-limit” girl. This is absolutely adorable! I found you at the TT&J link party, feel free to check out my Giant Cupcake Decoration tutorial http://brokemommycrafts.blogspot.com/2014/06/giant-cupcake-tutorial-i-made-one-of.html Cupcakes and gumball machines…looks like the makings of a SWEET birthday party. That would be a fun party! Hi!, love it!, what did you use as a lid?. Thank you! I used a clay pot saucer. Good luck!